Cashel Community School’s John Murray (deputy principal), Margaret Moore (deputy principal), Sinead Coffey, Aoife White, Sinead Bourke and John Gallagher (principal). 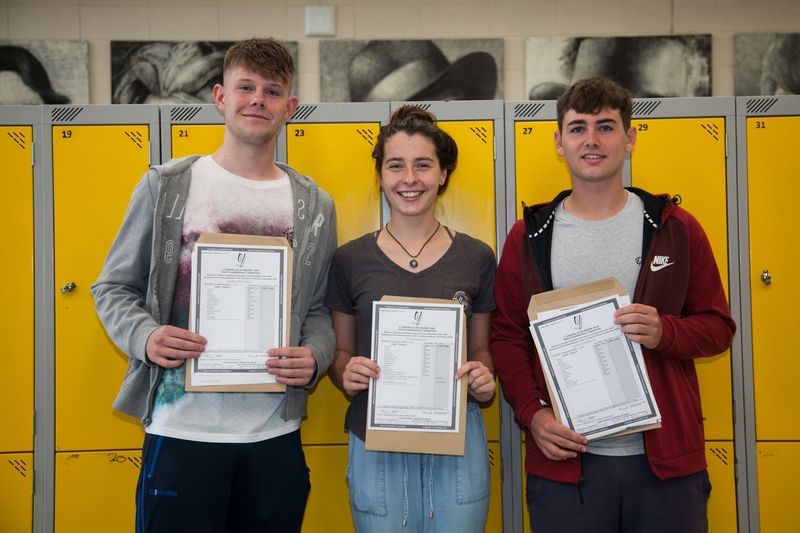 Student across the South East received their Leaving Certificate results on Wednesday. At Cashel Community School in County Tipperary, most students collected their results from the school even though they were available online from midday. “It was marvellous to see the delight and sheer happiness of those young people as they opened the envelopes, scrutinised the results and calculated their points. This year’s students have maintained the school’s proud tradition of academic attainment. An analysis of the results shows that 6% of our students attained in excess of 550 points, 10% attained 500 points or higher, while 30% secured over 450 points,” principal John Gallagher said. Daniel Fitzpatrick, Ciara Moloney and Kevin Fitzgerald. “We in Cashel Community School believe that success comes in many forms and the student body agreed that the results were a fair reflection on their work over the past five to six years. Whilst acknowledging the outstanding achievements of those pupils who scored very well in the Leaving Certificate, we also recognise and applaud the excellent achievements of the many students who fulfilled their potential”. Cashel Community School students are very confident of receiving their first choice when the CAO offers are published on Monday next. Going forward, Mr Gallagher advised students to consider all their options as they reflect on their Leaving Certificate results. Most Cashel Community School students are planning on accepting places for college but others are considering paths into training or direct employment. “Cashel Community School is very proud of the Class of 2018. It takes a huge amount of hard work and dedication on the part of students, staff and parents to achieve this level of performance. Many of the students exceeded their own expectations and it is wonderful to see their efforts recognised on a number of levels. We congratulate all of our students for realising their individual bests and we wish them every success in their future endeavours," he added.